Talk about initiating marriage counseling with the edge of a knife. She was angry enough to weild a deadly weapon. A furious wife confronted her husband with a knife after he was out all night drinking. She accosted him on a busy street in broad daylight wielding a deadly looking machete. She was intent on finding him and confronting him. 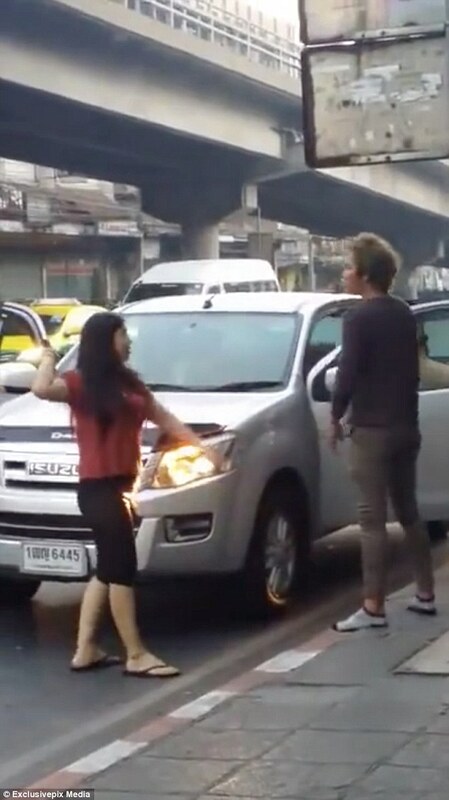 The woman drove around looking for her husband in peak hour, the morning after his bender in Bangkok, Thailand. A shocked onlooker said: 'From what she said to him, it looked like he had been out all night partying without telling her. 'She wasn't messing around. She told him to get in the car and get home. A video of the shocking incident went viral after it was recorded by a commuter who posted it online this week. The woman spotted him nursing his hangover eating breakfast at a street food stall and parked her car on the side of the road. As she confronted her disheveled husband she whipped out a huge hunting knife, waving it in his face, ordering him to go home. She actually hit him with the flat part of the knife threatening further damage if he persisted. As the man dawdled to the side of the road his wife whacked him with the flat part of the blade. When he was finally in the car she gave him a verbal lashing that he probably will never forget even after the alcohol fumes clear up. 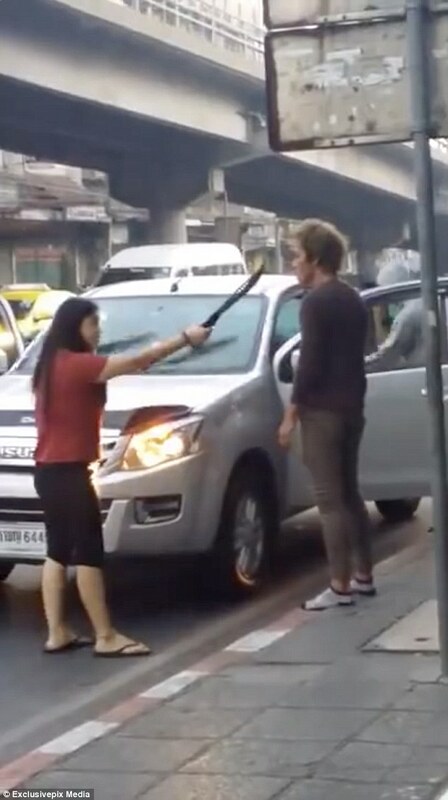 She ordered him into the front seat of her car, where onlookers heard him receive a severe ear bashing.